On behalf of the Chinese Embassy, I offer warmest congratulations to the launch of the Guangzhou-London route of China Southern Airlines. Its first flight yesterday was a great success. This reminds me of what happened eight years ago when I was Assistant Governor of Gansu Province. 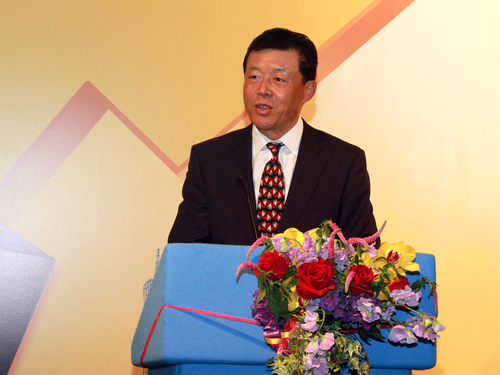 Then I attended the launch of direct flight between Guangzhou and Lanzhou on behalf of the Provincial Government. That route was operated by China Southern Airlines. Eight years have passed since that celebration in Lanzhou. 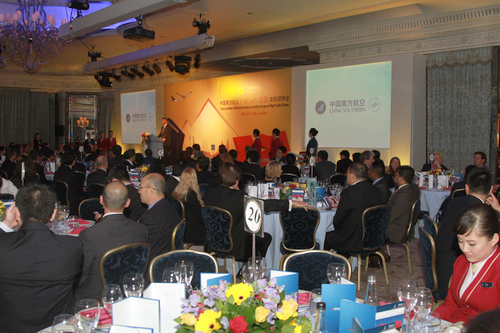 Now, I am speaking in London at the launch of direct flight between Guangzhou and London. This route is also run by China Southern Airlines. I can not believe this is only coincidence. Maybe there is a ‘predestined link’ between me and China Southern Airlines. 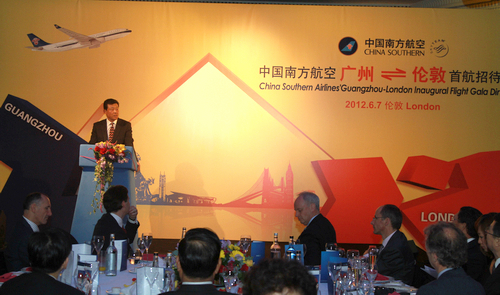 The opening of Guangzhou-London route is of great significance. It is a major milestone as all three major Chinese airline companies (Air China, Eastern Airlines and Southern Airlines) have opened direct flights from China to London. In geography, these routes cover Beijing in the North, Shanghai in the middle and Guangzhou in the South. The importance of this new route is best shown in three aspects. It will increase China-UK people-to-people links. In 2011, the number of two-way visits between our two countries hit a record high of 900 thousand. The launch of this new air route will greatly facilitate personnel exchanges between Britain and South China. It will boost such exchanges in particular for Guangdong Province and its surrounding Provinces. It will expand China-UK economic cooperation. The mantra of the business community is ‘time is money’. This new route will provide convenience for trade and investment between Britain and South China. It will also shorten the logistics cycle between the two. As you may know the lychee is a tropical fruit grown in South China, especially Guangzhou. The fruit has a very short shelf life. But, it is highly prized for its taste and aroma. With this new route of China Southern Airlines, you don’t have to be a Chinese Southerner to eat fresh lychees! The flight between Guangzhou and London takes only 13 hours. This new direct flight will promote China-UK exchanges in education, culture and tourism. 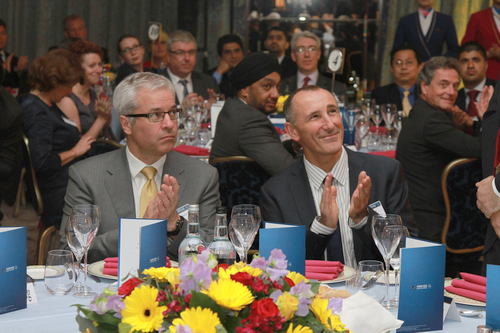 · There are now around 120 thousand Chinese students studying in UK. · Our universities have close cooperation. · Our two countries have frequent exchanges in culture. · There are more than 100 large cultural exchange programmes between us every year. · In just 50 days, Olympic games will be staged in London. · It is estimated that 250 thousand Chinese spectators and tourists will arrive in Britain from the mainland, Hong Kong, Macao and Taiwan. The launch of this new route is a timely event. It will build bridges by air for these exchanges and cooperation. Last but not least, I believe this route will make a handsome profit. It has sufficient customers. It is exclusively run by China Southern Airlines without any competitor. So it will generate high economic returns. The logo of China Southern Airlines is the kapok flower. It is the official flower of the city of Guangzhou. It is also known as the ‘hero flower’ among Chinese people. This is because its branches reach high. Its flowers are passionately red. On this note, I wish China Southern Airlines ever greater success. I believe its business will be as thriving as the blooming kapok flower. I also wish China-UK relations greater progress, and China-UK cooperation greater achievements!